It’s a deceptively simple question, and you may think you know the answer. Maybe your organization has phones, or alarms, or email addresses. You might use text messaging or panic buttons, but each of these methods when used on their own are unable to achieve the ultimate goal of communicating during an emergency: reaching everyone, quickly. We could go through the issues with each of these methods, but the bottom line is, one method of communication is never going to be enough to guarantee that everyone is being reached. 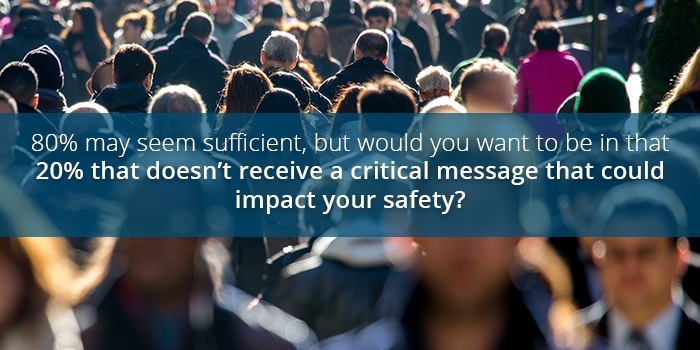 Stats like 80 percent may seem sufficient, but would you want to be in that 20 percent that doesn’t receive a critical message that could impact your safety? In this blog post, we’ll outline how an emergency mass notification system (EMNS) helps distribute messages to large numbers of people quickly, and why every organization should have one. At a basic level, the abilities of any robust EMNS should help improve the speed and reach of an organization’s emergency messages. When a crisis situation occurs, whether it’s an active shooter, severe weather or another emergency, every second counts. Leaders don’t want to waste time worrying about what kind of message they are going to craft or what people need to be notified. An EMNS can offer the ability to prebuild messages and groups so when an event begins, messages can be sent knowing they include appropriate instructions and are reaching the right people. An EMNS can also tie into existing technology, minimizing the need to log into different systems. This not only saves time, but helps leverage technology investments to be even more useful. A connected network of devices can include overhead paging, digital signage, desktop computers, desk phones and mobile devices, so that with one press of a button, each device can relay critical information, drastically increasing the chances that everyone receives the message. Now you know what an EMNS can do, but you still might not understand the “why”. For any organization, the chance someone may miss a message that impacts their safety shouldn’t be an acceptable outcome. This also falls under an organization’s Duty of Care. Organizations have an obligation to provide a safe environment for the people that come through that space, and need to take the proper steps to make sure that space meets this expectation. It’s important to assess what measures your organization currently has in place and what gaps you need to fill, because without the proper preparations, organizations are putting themselves and their people at risk. This can result in injuries, loss of life and potential lawsuits. An EMNS helps spread information quickly, can provide detailed safety instructions and helps fulfill an organization’s Duty of Care. For any organization, the safety of its people should be a top priority, and an emergency mass notification system can be a key component of making that goal a reality.